Petrus van Oeckelen can with confidence be called an exceptional figure: he was successful, unafraid of commercial or musical adventure, and of a perseverant nature. He was born in Breda on 15 August 1792. His father Cornelis worked as a clockmaker and also busied himself with carillons and organs. His companion in organ activities was the almost unknown builder Christiaanen (Christianus), who is documented as "master organ maker". Although Cornelis van Oeckelen worked as organ builder mostly on smaller projects like repairs, he made a few lovely instruments of his own, such as that at Oud-Beijerland. 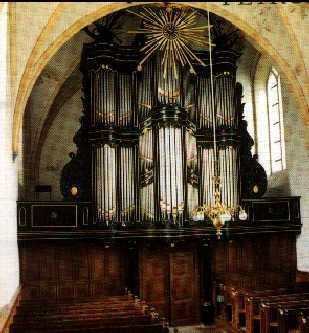 The beauty of this instrument earned him in 1837 the contract far as organ in the Dutch Reformed Church at Strijen. However, he died on 29 August of that year, and the instrument was finished by his son Petrus. In fact, this was already Petrus's second organ: a few years before, he had delivered his first to the Dutch Reformed Church at Assen. Between his young years and the construction of these two organs lies the important year 1810, in which he made one of the mast important decisions of his life: he moved from Breda to Groningen. A big step for a young man of 18 years! In addition Petrus, a Raman Catholic, found himself in the strangely Protestant north, where Catholic enclaves were found only in the largest cities. Petrus doubtless made the move with the certainty of sufficient means of livelihood. Unfortunately the nature of these means is not known. Probably he had already been appointed Carilloneur of the Martini-tower in Groningen; there could be no doubt of his experience in this field, as he had been Municipal carilloneur in Breda since his 1 6th year. Further it is probable that he had a job as organ maker's apprentice: there were two possible firms, that of Heinrich Hermann Freytag, which was continued after his death in 1811 by his son Hermann Eberhard, and that of Johannes Wilhelmus Timpe, who died in 1837. Whatever the facts may be, it is certain that he managed to win himself a place in the musical life of the city of Groningen, He made the transition from apprentice to independent organ builder in 1819 with the delivery of his first instrument, the organ far the Dutch Reformed Church at Assen. It is noteworthy that the term "musical instrument maker" is encountered with reference to him, implying that he occupied himself with more instruments than the argon alone. As 0 player he was competent on the organ, piano, carillon, violoncello, and contrabass. His personal life was also successful: on 30 June 1825 he married Joanna Maria Theresia Auwerda. They had 6 children, among them the sons Cornelis Aldegundis and Antonius, who were to continue their father's flourishing company after his death. The family moved to Harendermolen (Glimmen~, where their large house still stands. In addition to his musical capabilities Petrus van Oeckelen possessed the necessary diplomacy. There were various people in his circle of acquaintances who occupied important positions in musical life, and whose influence was mast useful in gaining him contracts. And there were a lot of contracts, because many congregations in smaller villages needed organs for their churches, sometimes to replace a harmonium. The nobility often played an important role in arranging for commissions: they were not only wealthy, but they were also often active as church trustees. In this connection it was particularly Jonkheer (squire) Samuël Wolther Trip who was important. He was an influential Groninger nobleman and in addition a useful amateur organist. He becomes as it were "ambassador" for the work of Petrus van Oeckelen, and was responsible for gaining him many contracts. And more than once it was Trip who played the instrument at dedication services. Van Oeckelen will doubtless have cherished the friendship which grew between them in the course of the 19th century. Petrus van Oeckelen is one of the first organ builders who developed 0 certain degree of mans production. Not only were the parts absolutely uniform and fabricated according to completely standardised procedure. Even the construction of cases was 50 standardised that they looked almost identical: the instruments at Saaxumhuizen and Usquert ore clear examples. Both in quantity and quality Van Oeckelen belongs among the greatest organ builders of the 19th century. Although his work, just as that of many of his contemporaries, has often been looked down upon, it is now beginning to receive more attention. These instruments have proven their solidity during the last 150 years, and the sound also offers much for the ear to appreciate: in particular the Viola di Gamba, one of the specialities of the house, has been widely praised. Produced by VLS-records, Beilervaart 61, 9411VC, Beilen, Netherlands.